The Wall Street Journal has updated its Hateability Index for 2014. 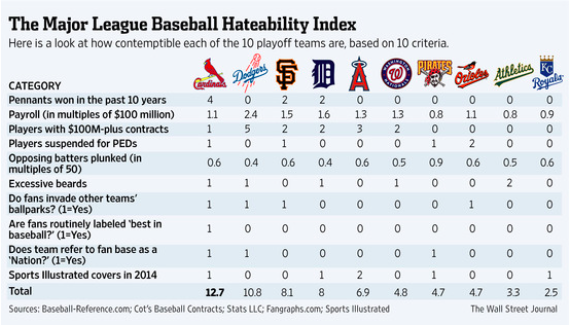 Dodgers are now, according to it, slightly less hateable than the St. Louis Cardinals. Duh. Excessive beards should be at least 2, maybe even 3. (Wilson, SVS, JP) How did we not have any SI covers? How many player of the months did we have? 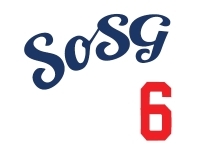 Kersahw going 41 consecutive scoreless innings? Come on SI! With SVS, Howell, and that cover, WE'RE THE MOST HATEABLE!!! Anytime we beat the Shards is cool with me. The fact that they refer to their fans as "The Best in Baseball" makes them way more hateable in my opinion. Surprised WSJ didn't somehow get "Doing things the Cardinal way" onto that chart. Very hateable. They need to add a "Proportion of fan base pasty white people" quotient. Well said, fellow pasty white person.